Sheep making their way down the main street. Up to 8000 people are expected to view the annual Great New Zealand Sheep Muster on Te Kuiti’s main street on Saturday, March 30. Now in its 27th year, the event attracts people from far and wide – and this time a train-load of visitors from Te Kuiti’s northern neighbours. This year, a Glenbrook Vintage Railways diesel train will roll into the Te Kuiti’s refurbished historical railway buildings. Up to 300 passengers will make their way to Te Kuiti for the day from Auckland, with stops in Waiuku, Glenbrook, Pukekohe, Hamilton and Te Awamutu. 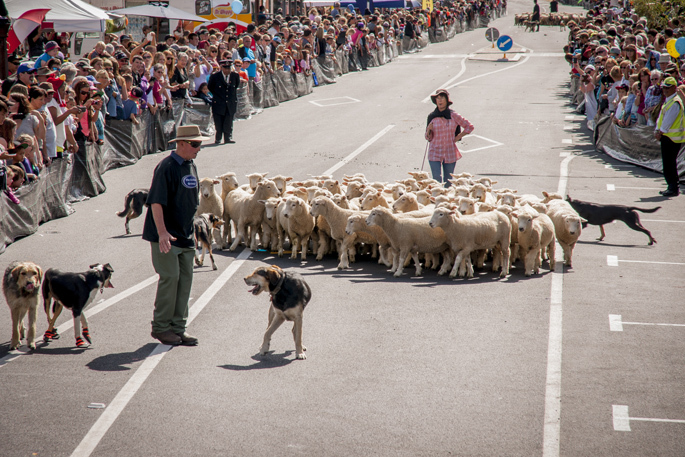 The day’s main attraction is the running of the sheep, where hundreds of animals are herded along Te Kuiti’s main street, starting at the northern end of town and making their way towards the town’s 6m shearer statue. The exact number of sheep is a closely-guarded secret and punters can guess how many sheep complete the run, in one of the many competitions on the day. Things kick-off at 10am and there is much more than running sheep to keep visitors entertained, says Waitomo District Council group manager community services Helen Beever. Local entertainers will provide live music, there are sheep dog displays, shearing demonstrations, market stalls, and an arts and craft area. There is also a basketball competition, a free bouncy castle, rock climbing wall and ‘dunk tank’ for kids to enjoy. “There will also be a chance for the more creative Great NZ Muster goers to enter the Wearable Arts Competition,” says Helen. Planning for the event began months ago, and this year around 40 volunteers are helping out to keep things running smoothly, says Helen. “It is Waitomo District Council’s main community event. The muster is timed to coincide with the NZ Shearing Championships, which runs from March 28-30, and sees shearers and woolhandlers from around the country gather in Te Kuiti for the three-day event. Muster-goers can watch them in action on the last day of competition. Te Kuiti bills itself as the shearing capital of the world, and with sheep taking over the street one day a year, a 6m tall statue of a man shearing a sheep at the town’s entrance, and being home to world champion shearer, David Fagan, who can argue?